Facial lines like nasolabial folds and melomental folds, thin lips, and hollow cheeks can diminish the face’s youthful roundness and make one look prematurely old, fatigued, and unhealthy. 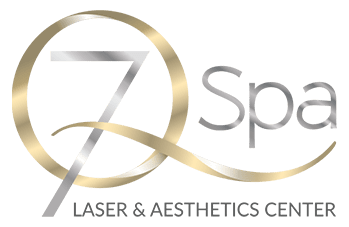 Fight the signs of aging and the effects of sun damage now with 7Q Spa Medical Center’s revolutionary Juvéderm® skin care treatments, and achieve the natural-looking, long-lasting results you’ve always wanted! Don’t wait to look your best; schedule a free Juvéderm® consultation at 7Q Spa today! Juvéderm® is a highly-effective, FDA-approved injectable gel consisting largely of hyaluronic acid. Because hyaluronic acid naturally occurs in one’s skin, Juvéderm® products seamlessly work with the body’s natural processes to create long-lasting, wrinkle-diminishing results. Most patients require only one treatment to achieve optimal smoothness, and Juvéderm®’s unique cross-linking ensures that each injection’s results last up to six months or more. Juvéderm® can be used anywhere on the face, though most clients prefer to use Juvéderm® to add volume to the lips, to fill-in hollow cheeks, and to decrease nasolabial folds and “marionette” lines. Specifically developed to give a smooth, natural look and feel, Juvederm® offers the perfect solution for clients seeking fuller, more attractive lips. Because it contains hyaluronic acid, Juvederm® actually attracts moisture and promotes the body’s growth of natural plumping elements, while the unique formula includes Lidocaine, a numbing agent, to ensure a completely comfortable treatment experience. With Juvederm®, client satisfaction is also higher than with almost any other filler; according to a recent study, 98% of people who used Juvéderm® reported that their lip augmentation goals had been achieved. Results typically last up to 12 months. Hyaluronic acid occurs naturally in one’s skin, and is primarily involved in repairing damaged tissue. When skin is exposed to excessive sunlight, however, skin cells slow production of hyaluronic acid, resulting in a loss of skin tone, fullness, and structure. Juvéderm® works by safely replacing the skin’s lost hyaluronic acid and reversing the degradation, seen primarily as wrinkles and creases, caused by harmful UVB light and other environmental factors. Juvéderm® Ultra™ is a thinner, less-viscous option (6% cross-linked) used to soften fine-to-moderate wrinkles, slightly augment lips, and diminish the appearance of scars. It is primarily used in higher areas of the dermis, and most clients experience results lasting about nine months to one year. Juvéderm® Ultra Plus™ is more robust than Juvederm Ultra™ (8% cross-linked), and is thus more effective in treating deeper wrinkles and like nasolabial folds and for adding shape to one’s face. Because of its viscosity, Ultra Plus™ provides more dramatic results and lasts much longer – most say up to a year or more. The first and only FDA-approved filler to correct age-related volume loss in the mid-face, Juvéderm® Voluma™ is the ideal treatment for hollow cheeks, sharp cheekbones, and prominent chins. Billed as the next step in “permanent skin care treatment,” the effects of Voluma™ can last for up to 24 months.